The model - Best Choose released two further Toyota Coaster minibuses in December 2014, the other being a red minibus (147605). In 1967, there was a riot in Hong Kong and the public transport service was disturbed severely, many buses couldn't go out to serve as many bus drivers join the strike, Some buses are destroyed by the arsonists. As a result, some mini buses with 9 seats started to serve the public, it was illegal at that time as some members in the Transport consultation board opposed to declare mini bus as legal. As time passed on, as the bus services still were not adequate and in the late 1960s, mini buses became legal and they had 14 seats. 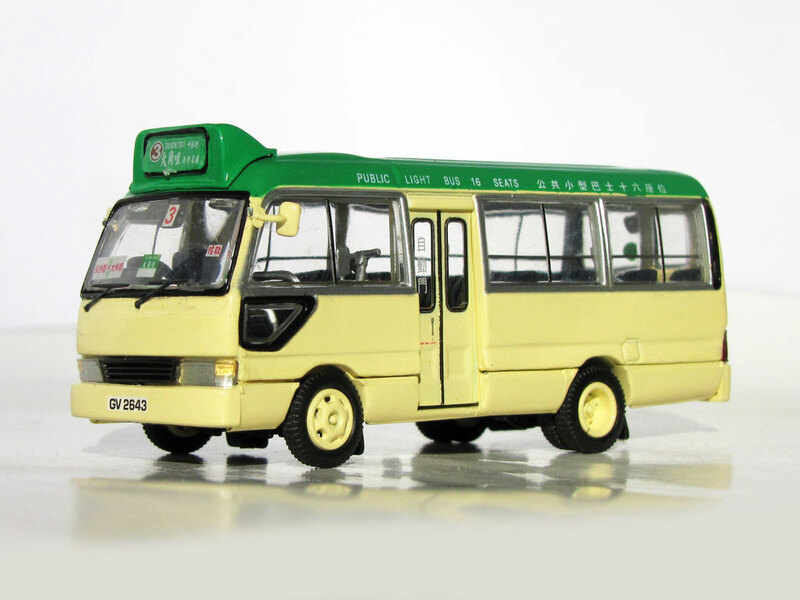 In 1972, there was Green Mini Buses, they are similar to buses, both of them have fixed routes, fares and timetable. Hong Kong government's policy is encouraging the mini buses operate as the green one. Also in 1980s, the mini bus turned into 16 seats. 60% of mini buses are the green one. For the red mini buses, they can choose the route and set the fare according to the owners and drivers' decision. However in Hong Kong, many red mini bus routes are controlled by the triad society and the drivers need to pay part of their income to join the routes. In Hong Kong island, only one route, (Kennedy Town to Shau Kei Wan) can be joined without paying money to the triad gangs. In these few years, many mini buses were involved in serious accidents because of the careless and rude driving attitude of drivers. The mini buses received the largest amount of complaints among all the means of transportation. HKSAR government also launches measurements to reduce the accidents caused by the mini bus such as increasing the penalties etc.